Tech review: The powerful $99.99 device made by Scantool.net not only can read “check engine” error codes but also provide information on such things as fuel mileage, engine performance, and speed and acceleration rates. My dad used to work on his cars. I like to think I helped, but I just held the light where he was working. As cars get more and more complex, doing your own work is getting harder. We are all familiar with the dreaded “check engine” light. Most people take their cars to their dealers or a local mechanic to get them to read the engine codes and tell them what has gone wrong. Almost every car made after 1996 has a port under the dashboard to connect diagnostic systems. This port is called the OBD-II port (onboard diagnostics). It used to be that only dealers and mechanics had access to the computers and cables that could connect to the port, but technology advances have brought products that let people read their own engine codes. I’ve been testing the OBDLink MX+ ($99.99) from Scantool.net, which uses a wireless dongle to connect your car to your smartphone, tablet or Windows PC via Bluetooth. There are all kinds of engine statistics you can access if you have a device like the OBDLink MX+. Not all manufacturers make the same information available, but you’ll be surprised at what you can find out about your car when you connect the OBDLink MX+. 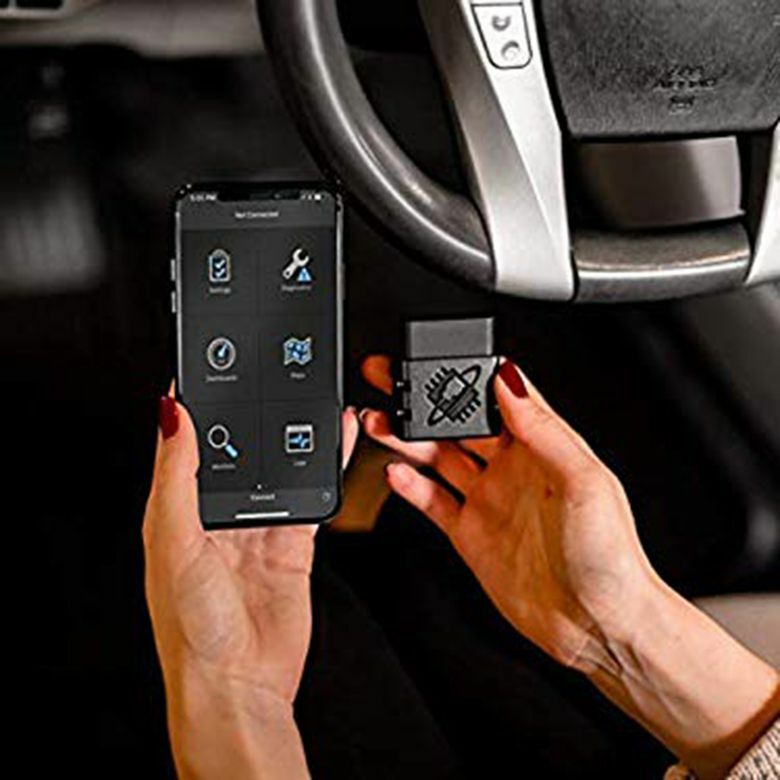 The device has apps for iOS, Android and Windows (sorry, Mac users) that can display all the information that can be extracted from your car. The app lets the user completely customize information screens called dashboards that consist of digital or analog gauges that can be set up in different sizes and shapes. You can have multiple dashboards for different situations. One very cool feature of the OBDLink app is that you can put the dashboards into “heads up display” mode, which flips the screen so you can place your phone on your dashboard to see the display reflected on your windshield as you drive. It’s a slick feature. If you have your own favorite car app that uses OBD-II data, chances are the OBDLink MX+ will work with it. The app stores for iOS and Android are filled with different apps to access the data. The OBDLink MX+ can read engine error codes to let you know exactly why your check engine light is on. The included app has information on thousands of codes so you are presented with a clear explanation of what’s happening. Cheaper OBD-II dongles just give a code number and make you look up the error. The MX+ can also clear the dash lights if you like. Of course, those lights are on for a reason, and unless you know the severity of the problem, you should not just turn off the lights without checking with a mechanic. The MX+ takes a bit of time to set up the first time you use it. You’ll download the app and then plug the dongle into your car’s OBD-II port. If you’re not sure where your port is, just Google the specific year and model and the words “OBD-II port location” and you’ll find it. Every car I’ve tried has it located on the driver’s side, under the dash to the left or right of the steering column. You’ll likely have to get your head down near the floorboard to see where it is. When it’s connected, you’ll see a power light and a Bluetooth light come on. You’ll need to go to your phone’s Bluetooth preferences and look for the dongle to appear in the list of available connections. Make the connection and then launch the app and you’ll see the main screen, where you’ll still need to touch the “connect” button. I never had trouble getting it connected, but I did need to press the connect button each time until I found the setting for having it connect automatically. Not a big deal, but worth mentioning. I’d like to say I customized the heck out of the dashboards, but in reality, I used the default gauges and they all worked really well. The MX+ has no trouble communicating the car’s information to the app. There was no lag that I could discern. The dashboards are lined up like the home screens on your phone. You can swipe between the dashboards and create as many as you need. My Honda Fit doesn’t have a digital speedometer, so I really liked the dashboard with the large digital speedometer. I have to admit that I don’t know much about my engine. I’m not sure why I’d need to know about the real-time data coming from my car’s oxygen sensor, but I can see it. I do like seeing the real-time gas mileage, which I use to help me get more miles from my tank. I changed the way I used my gas and brake pedals to try to get better mileage. There is a section of the main app screen called Monitors that can help you prepare for emissions testing. From the type of vehicle you own, the app can check the emissions testing that can be done internally to tell you if your car is ready for the test or needs work. The OBDLink MX+ is not the cheapest OBD-II dongle you can buy, but it does everything you might want it to do (within the limits of your individual vehicle). If you just want to read a code and you won’t ever use it again, this device might not be for you. But if you’re the type of person who likes to keep a watchful eye on engine performance, the MX+ is a great choice.